Home > magnet-applications>Applications of magnets>How Can We Make A Magnetic Broom Or Where To Buy It? How Can We Make A Magnetic Broom Or Where To Buy It? If you want to acquire a magnetic broom or make it with your own hands, enter the following article and follow the instructions. Anyone who owns a property with grass should cut it and take care of it from time to time during the warmer seasons. The lawn mower is a sensitive device, and the mower blades do not work well if there are hard objects, such as stones or even small metal pieces on the ground. To avoid damaging the mower blades, it is a good idea to remove the metal parts before mowing the lawn. A simple tool to collect metal parts, such as screws, nails, washers ... is the magnetic broom. 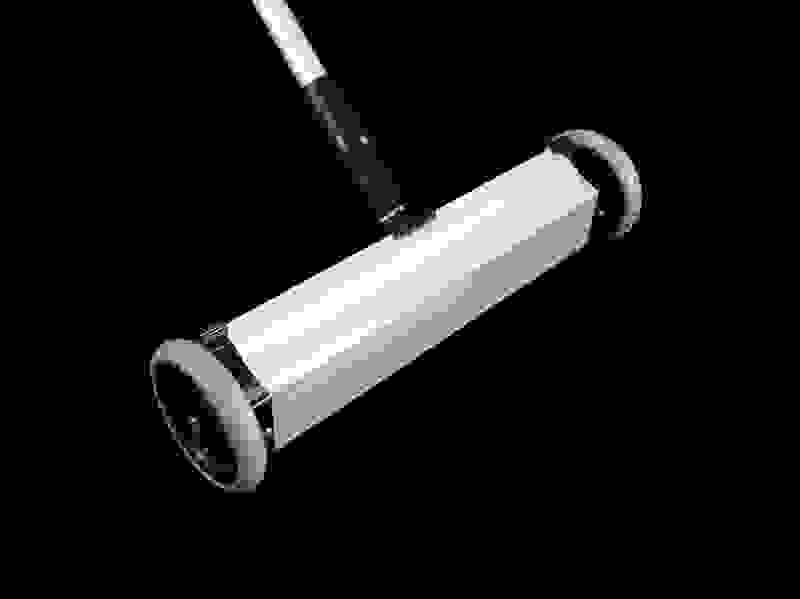 With a few tools that can be obtained at any hardware store, a magnetic broom of this type can be easily manufactured. A magnetic broom is a simple and manual device that has 2 wheels and a handle to guide it. With the handle, the magnetic broom can be pulled or pushed on the lawn. The neodymium magnets attached, which are covered with a non-metallic foil, attract the metal parts found on the ground, which are then trapped in the non-metallic foil. After a successful search with the magnetic broom, you can bend the non-metallic sheet and the collected metal pieces are dropped on a cloth or in a box. A flat wooden board, which then represents the width of the magnetic broom, is cut to the desired length. On the two ends of the wooden board a hole is drilled, which serves to screw in the shaft of each of the wheels. On the flat lower part of the wooden board, a steel plate is screwed. Several magnets, preferably 2 rows of 5 magnets of the same type, can be attached to this steel plate. Of course, these can be magnets with a hole. Over these magnets, a non-metallic sheet is attached. The non-metallic sheet is fixed with a hinge on each side, so it can be bended away from the magnets. This device subsequently facilitates the release of the accumulated metal parts that hang from the non-metallic plate. The distance from the bottom edge of the non-metallic plate and the floor should not be more than approximately 50 mm, so that even small magnets can catch and lift small metal parts. The magnetic broom is a good example of how not only the choice of the type of magnet and the material of the magnet, but also the arrangement of the individual magnets in the two series greatly influences the geometry of the total magnetic field. Whatever you decide, you can count on IMA for good advice and assistance in the complex field of magnetic technology. Contact us with any questions about magnetic matters. If you want to buy the magnetic broom already manufactured with reliability and high quality, you can contact us or buy the product directly on our website. The arrangement of the 10 neodymium magnets in the two rows of 5 pieces has a great influence on the formation of the total magnetic field. Arranging the magnets with alternate magnetic poles (north pole to south pole), produces a greater magnetic field and traction force. At slightly greater distances, the attraction weakens. If the magnets are arranged so that one row always points down with the north pole, but the second row always points down with the south pole, then the total magnetic field in the center, between the two rows, becomes considerably stronger. However, this amplification of the magnetic field has an effect only up to a distance of approximately 25mm. In the third arrangement, all 10 magnets with the north pole facing down. This also results in an amplification of the total magnetic field, giving a distance of approximately 50mm to the ground. The difficulty with this arrangement of magnets is the assembly, since two of the same magnetic poles repel each other. Therefore, with this arrangement, the use of a magnet with a hole can be useful.